(VICTOR FRANK) LAWRENCE JONES (25/04/2015 – 28/07/1963). My beloved dad would have been 100 years old today (having been born on the first Anzac Day), if he had not been stolen from us just days before my fourteenth birthday (brain cancer) fifty two years ago. Tomorrow I will be able for the first time to apply for his birth certificate, so I can at last discover his true birth name (which I have never definitively known). His brother, Basil believed he was named after ‘Lawrence of Arabia’, but this is certainly an anachronism! He could not serve in WW2 (unlike Basil who served in North Africa, New Guinea, etc) though he applied many times, as he was in ‘essential industry’: beekeeping (500 hives) and steel-making. 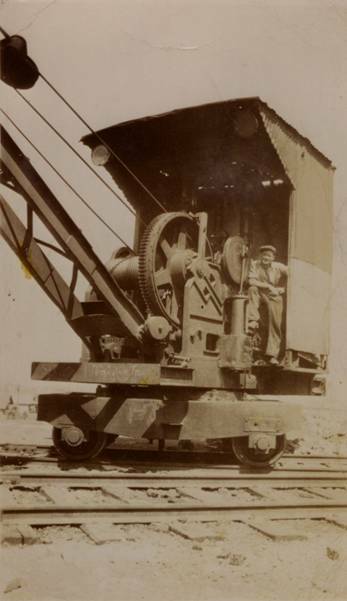 Here he is pictured on a crane he used to operate in the 1940s at ‘Commonwealth Steel’, Newcastle. I worked there myself for a time in the 1960s. We only have a handful of photographs of him, none of them clearer than this. He too (like his father and his son) was a keen hunter. Hard to believe you can still miss someone so much half a century later. PS: The birth certificate showed Victor Frank Lawrence was his real name.